VINTAGE CHAINSAW COLLECTION: SHOWS AND ARTICLES. CTV REGIONAL CONTACT(JOEL HASLAM):MAY 29TH/2010, 6:30PM , MUSEUM VISIT, INTERVIEW AND CHAINSAW EXHIBIT. ARTICLE,HISTORY,EXHIBITS AND INTERVIEW WITH "CTV REGIONAL CONTACT". 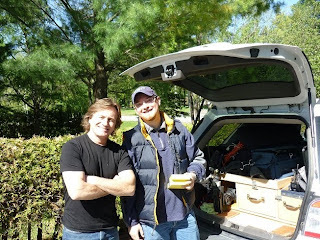 Picture: Joel Haslam, Me and Peter the camera man. 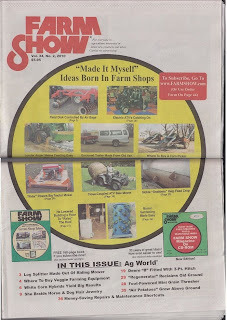 FARMSHOW NEWSPAPER MAGAZINE: ARTICLE ON THE MARCH 2010 ISSUE BY DEE GOERGE, CONTRIBUTING EDITOR. 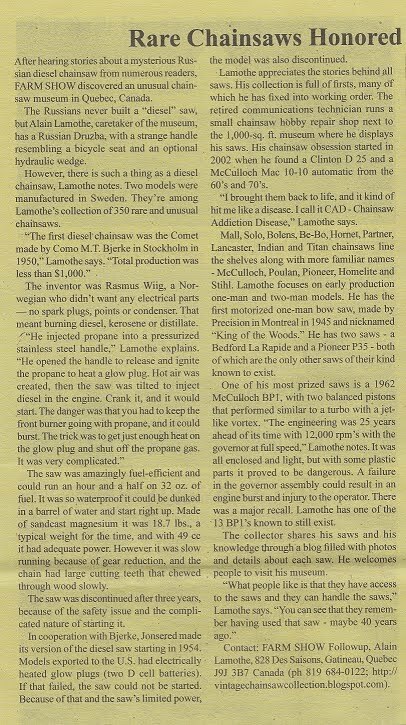 An endless variety of steam, gas, diesel, or electric power plants, plus drums to hold wire rope; all used to haul logs from the woods, to load at landings, move equipment, rig up trees, and in the old days , to lower cars down inclines... The most common makes were Seattle, Portland, Tacoma, named after iron works in those cities, Vulcan, Smith and Watson, and others named after the company which built them... 26 different types of steam donkeys were built in the Pacific Northwest by one firm alone. In 1913, one company built 51 donkeys in a 49 day period, all sold before they left the plant to fill rush orders...Donkey was a term originally applied to a little steam engine of less than one horsepower. A man by the name of Dolbeer adapted a ships capstan for his logging rig, and it is possible that he also brought along the seafaring term for the engine itself.Steam logging equipment has marked our journey through time as the West Coast became part of national industrialization. The use of steam donkeys in particular were machines that typified the heyday of logging in the West, machines whose power and grace left a mark on the men as well as the mountains. 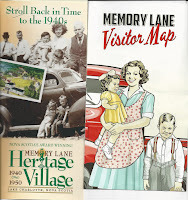 Those steam donkeys that still exist create a three dimensional scrapbook of history. Donkeys are, in fact, a link to the "glory days of logging," as one writer put it. 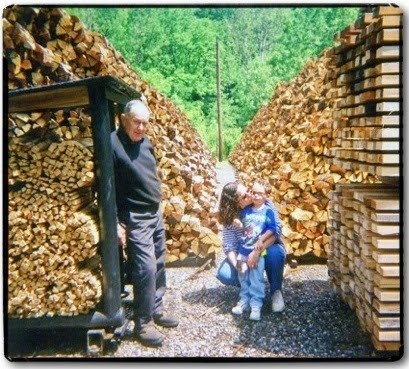 Those who worked the "big woods" around the steamers speak of a time, now gone forever, with reverent nostalgia. 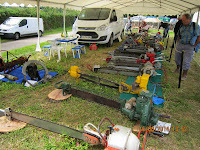 However, it is not necessary to be a steam logging equipment lover to morn the demise of steam donkeys. You don't even have to like donkeys or logging history, but it is important to realize that: (1) of the thousands that were built during the age of steam, only thirty some remain in Oregon. (2) Of those remaining in Oregon, few are anywhere near operating condition. (3) Only a few donkeys built during this time period up to 1930, were not steam powered. 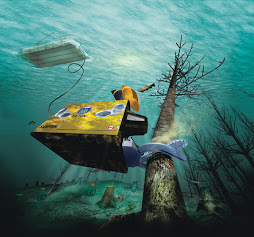 How could these machines have disappeared so fast? Why have the traces been almost totally erased? 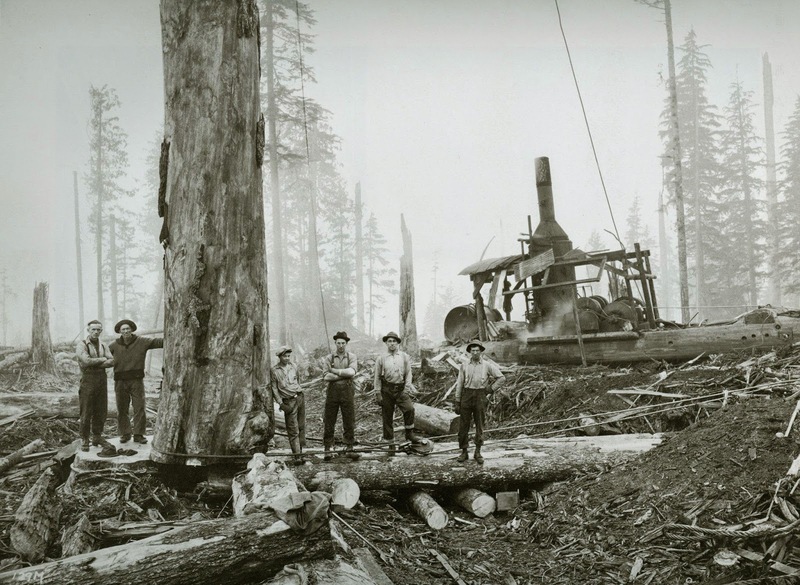 Were the Willamette Two-Speeds, the Lidgerwood skidders, and the duplex loaders only devices used to transport logs from stump to railroad, useful then, but now forgotten? ...MERV JONHSON. 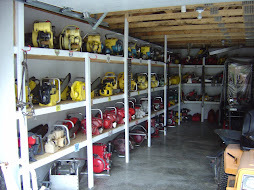 There are no information about air saws to my knowledge simply because the production was not intended for common residential use or commercial use. This is currently under development……. 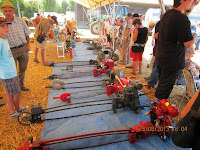 OLD PICTURE AIR SAW INGERSOLL. 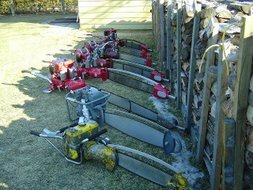 Reed-Prentice/Timberhog were made only on special order request mainly for industrial use with specific contracts and quantities for the military (WW2) and underwater tree cuts when flooding an area for hydro-electric dam in the north. 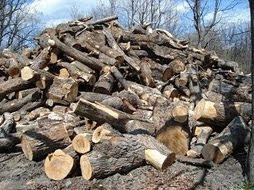 Contractors used them to salvage good trees cut to sell in the paper mills. To operate, they required around 70 cfm and were hook up to a portable engine/compressor/ air hose on a trailer attached to a “jeep” or an “all terrain vehicle”. For the military , they used them for land and road access in the wars …. 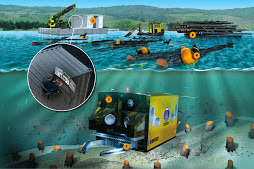 building temporary bridges for crossing rivers and cutting trees underwater. 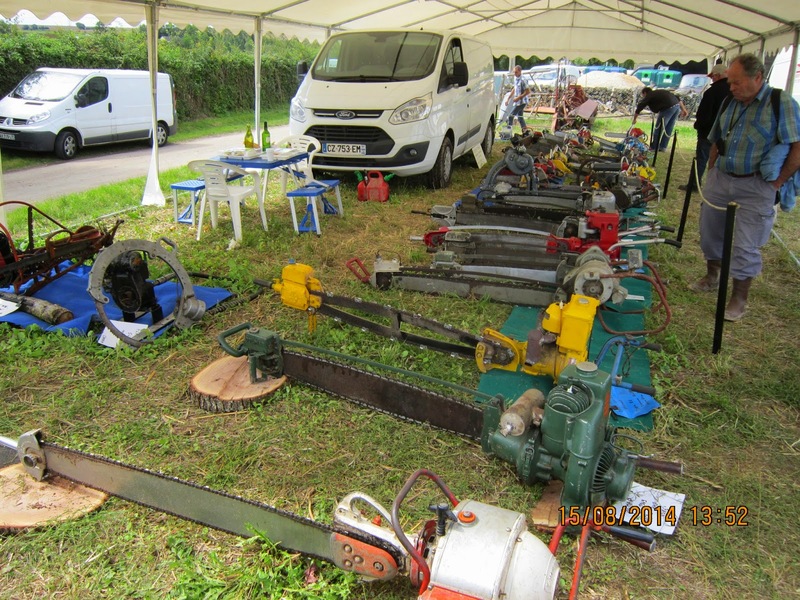 This is why they are so rare and finding a good one in decent shape is a bit tough.The “Wright” air saw (and gas saw) since it had reciprocating blades needed no oiling and was used by butchers and ice block cutters on lakes…..again mostly for industrial use. 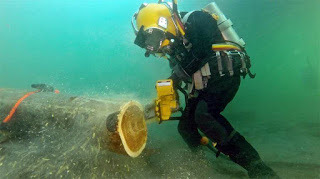 The new "green solution" is to salvage all the trees that have been left uderwater when doin hydro dam contruction. 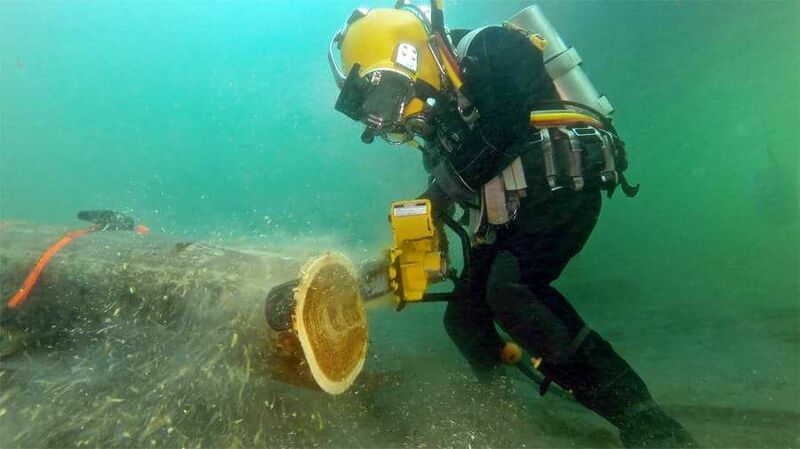 Using mechanized robots (deep water recovery) or pneumatic saws is the way to go. 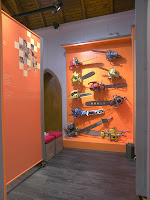 SOME OF MY SAWS IN MUSEUMS AROUND THE WORLD. 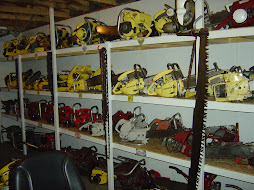 The motivation for this brief review of the introduction of chainsaws into Nova Scotia was a project commenced by the Lake Charlotte Area Heritage Society in 2014 to restore the Society’s woodworking and metalworking shop within Memory Lane Heritage Village to what might have been in existence in the area prior to July 1 1950. 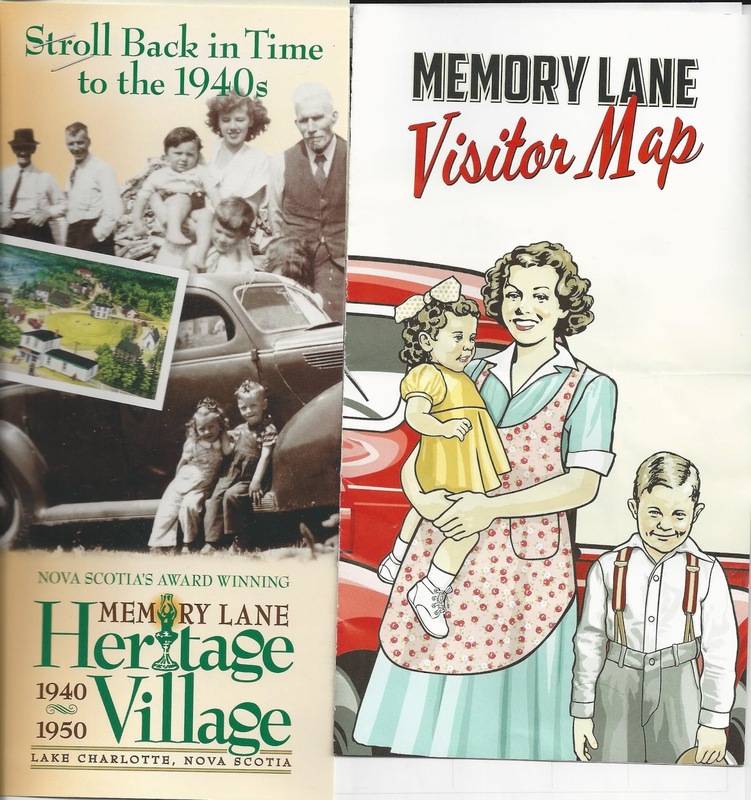 In order to plan the restoration, research was undertaken to determine what kind of woodworking and metalworking shops existed in the surrounding area between 1940 and 1950. 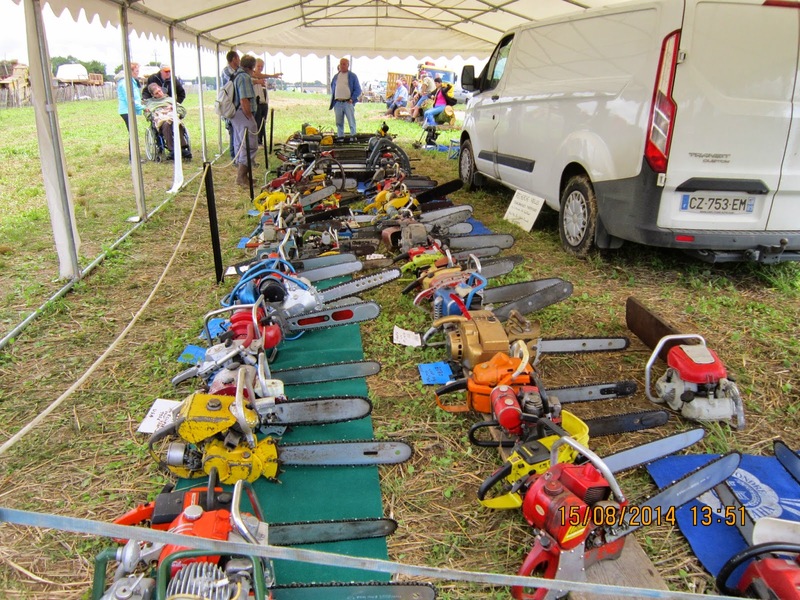 One aspect of this research was to determine if chainsaws might have been used in local forestry operations and thus could have been found in association with a local sawmill or wood manufacturing operation. An on-line search for relevant information did not produce any directly applicable results. 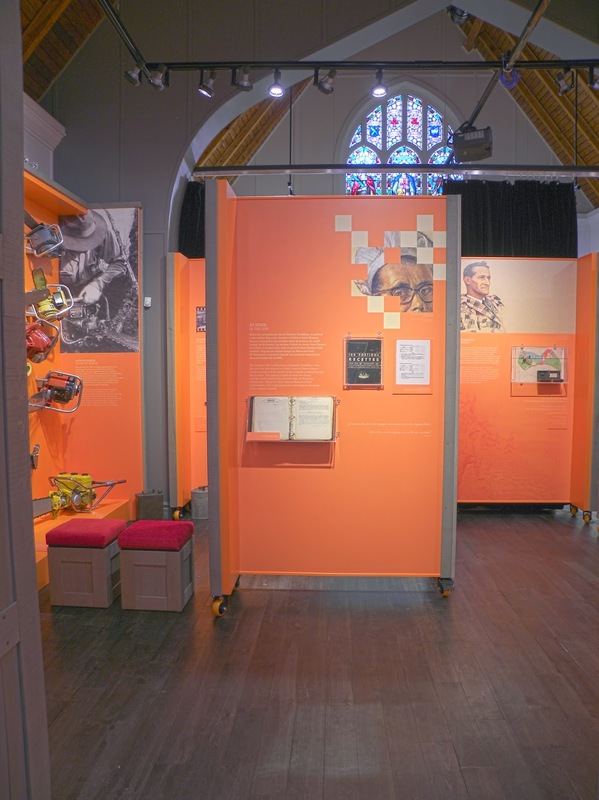 Similarly, a search at the Provincial Archives of Nova Scotia produced a negative result. 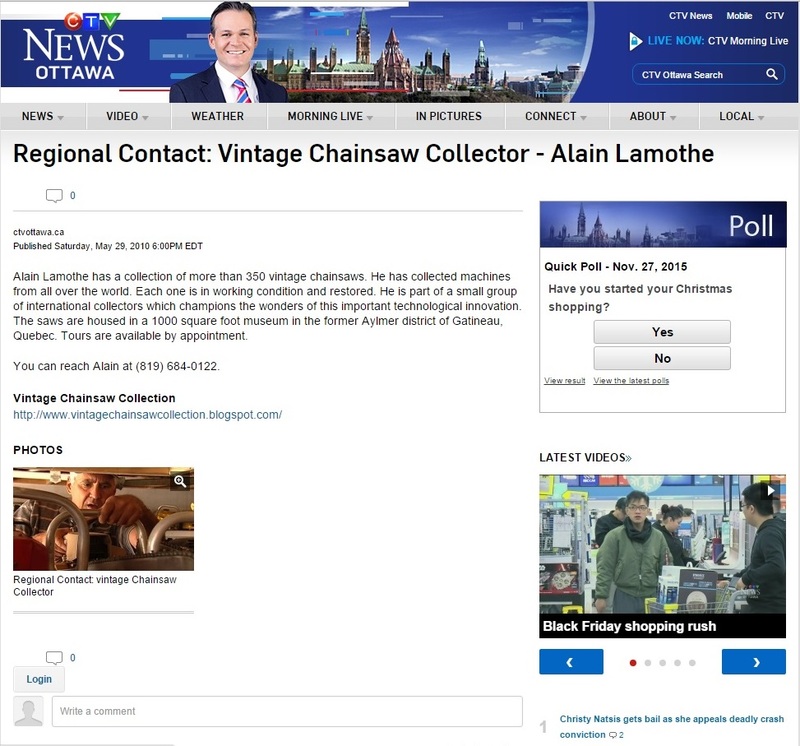 However, an appeal via an interview with the local CBC morning radio program was more successful, leading to Mr. Alain Lamothe, a chainsaw collector, restorer and researcher who owns a private chainsaw museum in Ottawa . 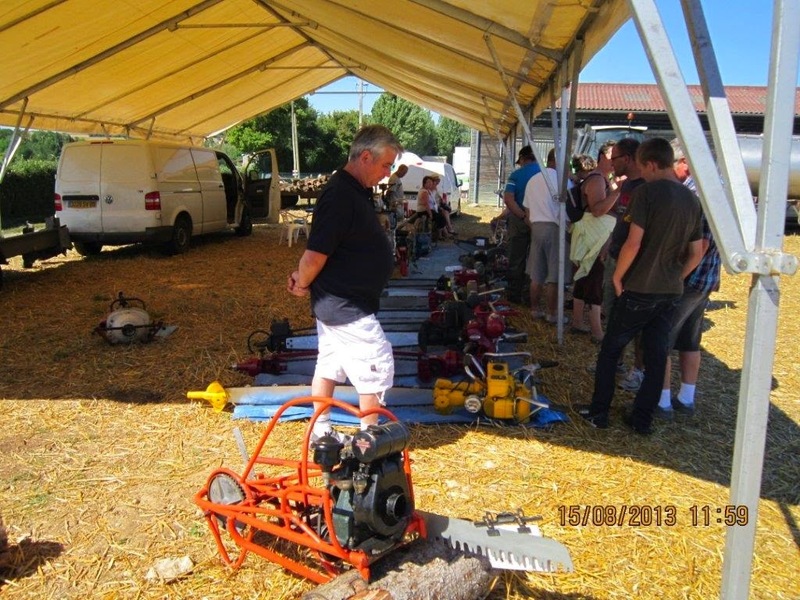 Mr. Lamothe, along with Mike Acres of Vancouver, who runs the Chainsaw Collectors Corner are the deans of chainsaw history in Canada and a fount of accurate knowledge and a willingness to share this knowledge. 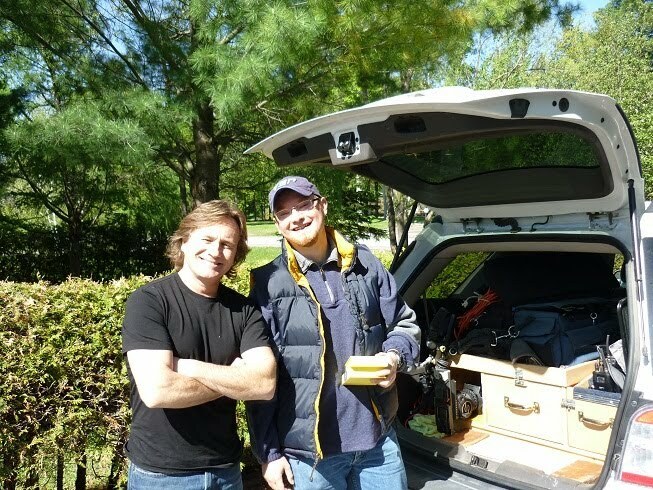 With the help of these two men and a copy of “Chainsaws – A History” , researched and written by David Lee in conjunction with Mike Acres, the search began. 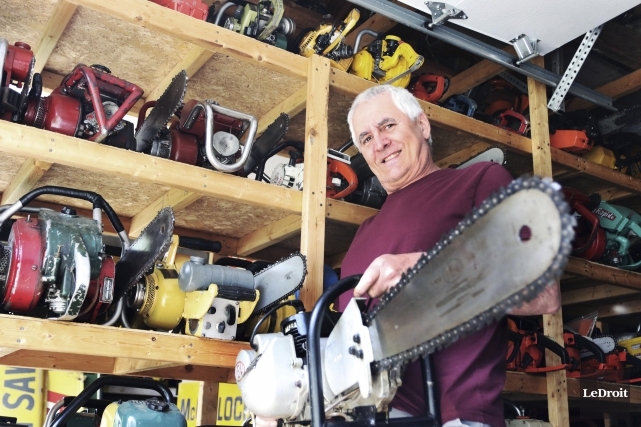 The first key piece of information is that any chainsaws purchased and used in Nova Scotia prior to July 1 1950 would likely have come from one of the few Canadian chainsaw manufacturers who actively sold their product right across the country. 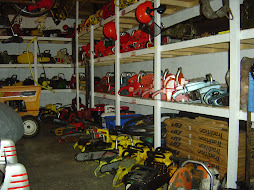 It is possible that an American-manufactured saw might have been acquired by itinerant Canadian loggers working in the US, or through friends and family in the US, but probably not through an American manufacturer distributing their saws within Nova Scotia, as no such arrangement is known to have existed at that time. 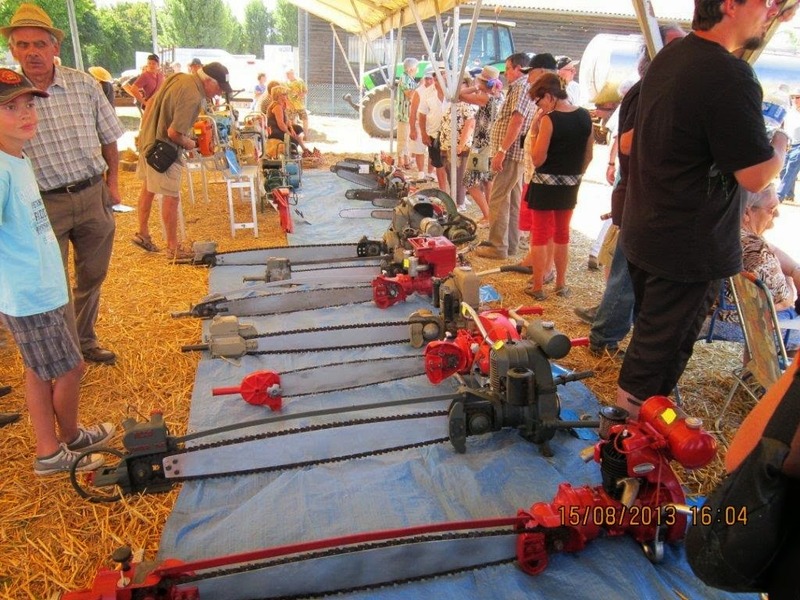 The manufacture of chainsaws in Canada essentially begins in 1939 with the advent of WW2 and the consequent stoppage of Imported chainsaws from Germany. 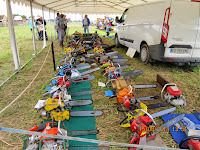 German chainsaws, particularly those made by Stil and Dolmar, were recognized as some of the best in the world and were available in Canada from about 1936 onwards. But it was not until 1937, when Andreas Stihl signed an agreement with the D. J. Smith Company of Vancouver as his North American distributor, that sales increased. By 1939, on the eve of WW2, just one of the leading west coast logging companies had thirty two-man Stihl machines at work. As the North American distributor for Stilhl saws, the D. J. Smith Company had developed the capacity to repair Stihl saws and to make parts from scratch if parts were not speedily available from Germany. 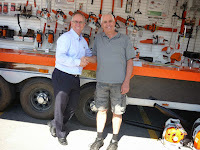 Thus the company was well positioned to start building its own saws, essentially duplicating the Stihl saws, when WW2 commenced in 1939 and the importation of German-made saws stopped. With the advent of WW2 the forest industry of Canada expanded rapidly and because the trees on the west coast were generally much larger than those in central and eastern Canada, there was a market for the heavy, expensive, two-man saws with long bars that were then state-of-the-art. 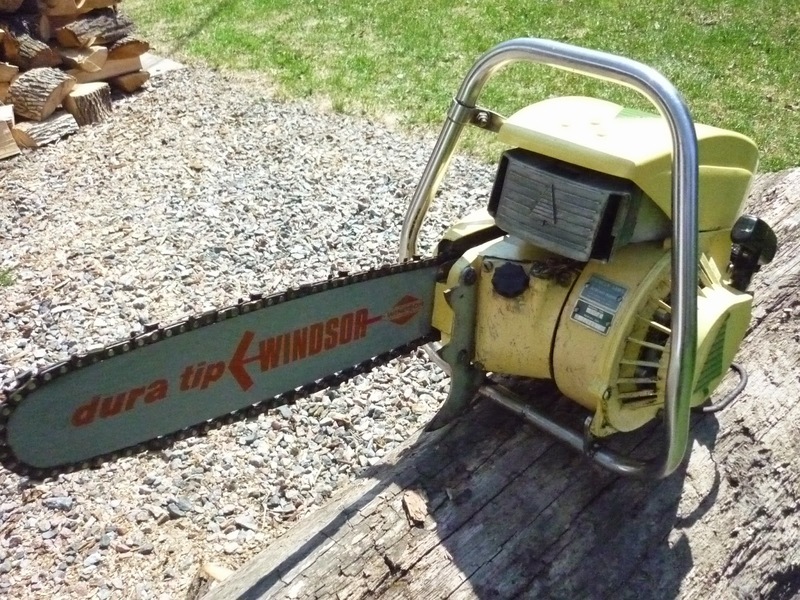 Lighter, one-man saws with shorter bars, more suited to the smaller trees supplying the forest industry of central and eastern Canada, were not developed until 1946. The wartime years saw a proliferation of chainsaw development and manufacturing in Canada, primarily but not exclusively, in Vancouver. 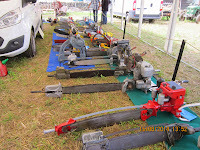 The D. J. Smith Company was taken over by Reed-Prentice, a major American saw manufacturer, in 1940, producing both American-designed saws as well developing a number of its own design. Then, in 1943, the ownership of the D. J. Smith Company changed hands again when it was purchased from Reed-Prentice by a consortium of Vancouver businessmen who renamed it Industrial Engineering Limited (IEL). 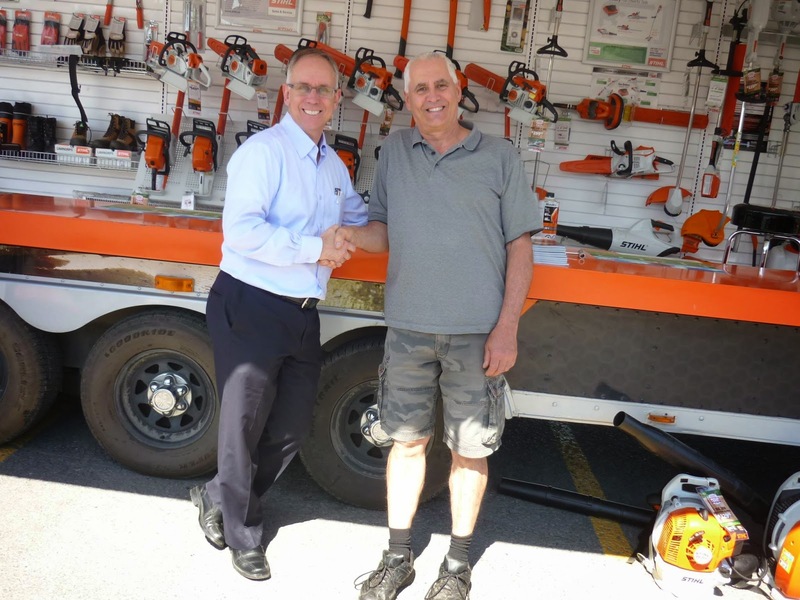 Don J. Smith, as a part owner of the D. J. Smith Company, took his proceeds from the sale of the company and moved to Guelph, Ontario, where he founded Hornet Industries Ltd. During this same time period another Vancouver-based manufacturer, Power Machinery Ltd. was established, and in 1947 issued its first chainsaw. 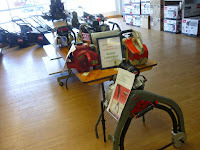 The only other known Canadian chainsaw manufacturer in business prior to 1950 was Precision Parts Limited, located in Montreal. 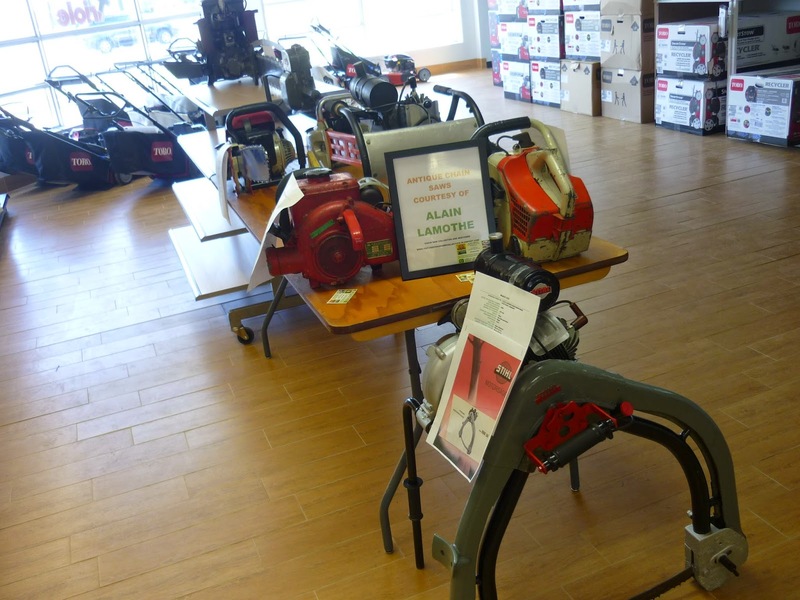 Thus it is probable that any chainsaw purchased in Nova Scotia prior to July 1 1950 would have been made by Industrial Engineering Limited (IEL), Hornet Industries Ltd., Power Machinery Ltd., or Precision Parts Limited. However, there is still a possibility that a US-manufactured saw might have made its way to Nova Scotia prior to 1950. 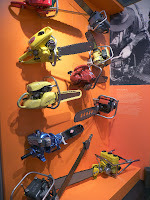 There was a surplus of saws in the US at the end of WW2 and well-established work and family connections between the Maritimes and the US east coast. 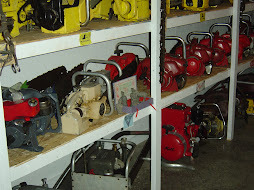 The most likely possibilities are saws made by Disston, Titan, McCulloch or Mall. 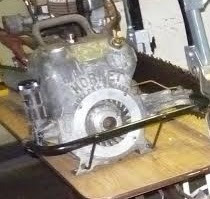 As of January 2015, the earliest chainsaw in Nova Scotia for which there is a solid provenance is a Hornet Industries’ Model HJ one/two-man chainsaw, serial number 5219, purchased in the summer of 1947 . 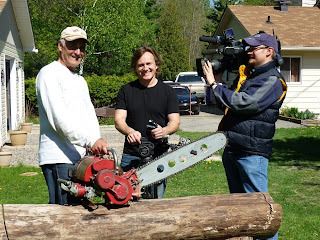 The saw was purchased for $290 (roughly equivalent to 25 weeks of pay at that time) by A. C. Decker and Sons, who used it to cut large yellow-birch trees at River Lake near Mooseland. This saw is still in the possession of Henry Decker of Upper Musquodoboit, now 90 years of age, who remembers the purchase clearly. to purchase from receivership a water-powered sawmill near Mooseland. Upon discharge, Mr. Decker went to work for the family company and he clearly recalls that in the summer of 1947 Carney Rector brought the same saw out to where they were working at River Lake. To reach their logging site required a boat trip and the salesman started the saw in the boat, presumably demonstrating how easy it was to start! 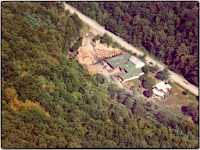 The ensuing demonstration on the large (3’ diameter ) hardwood trees was successful (although a notch was needed on the largest trees to accommodate the “helper handle” and the company bought the saw on the spot. 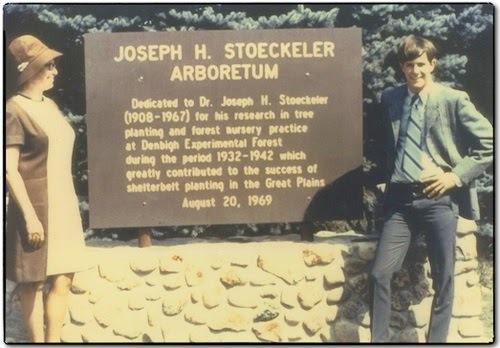 Mr. Decker recalls that “anything was better than a crosscut saw”, although the purchase had to be approved by his father “who was the boss”. The saw itself was well cared for, being brought back to the bunkhouse every night to be sharpened (they could only afford one chain) and then placed behind the stove where it was warm. In the morning the saw would be taken outside to be started to make sure everything was working well before heading out to work. 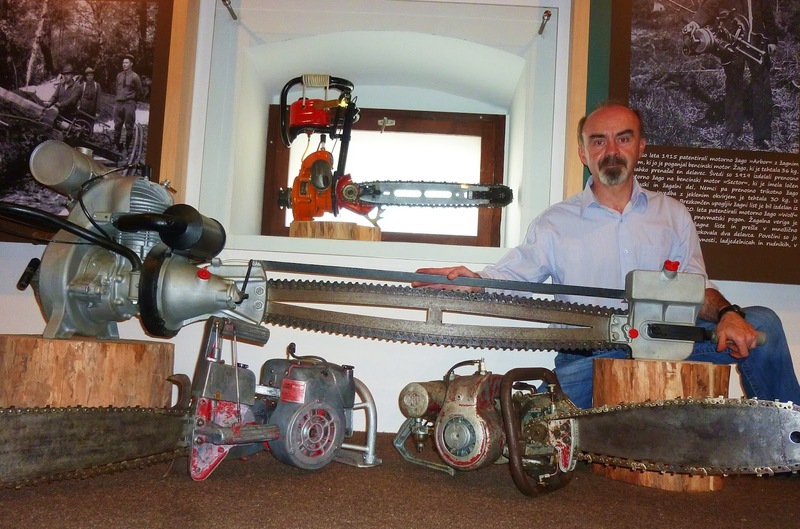 The saw was used until at least 1951 as Mr. Decker’s mother has an entry in her diary noting that the saw had been used to cut up railroad ties in Middle Musquodoboit. 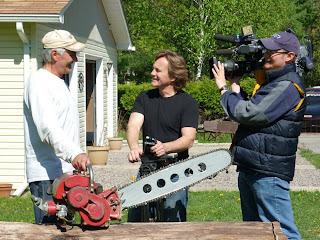 Mr. Decker does not recall that anyone else had a chainsaw at the time, most people thinking that they were crazy to pay so much money for a saw. However, he does recall that a Doug Glawson of Mooseland did buy one later, and that he thinks the Canadian Lumber Company in Stewiacke might have had some, and that these purchases would probably have been for two-man saws because he does not recall one-man saws being used until about 1954. 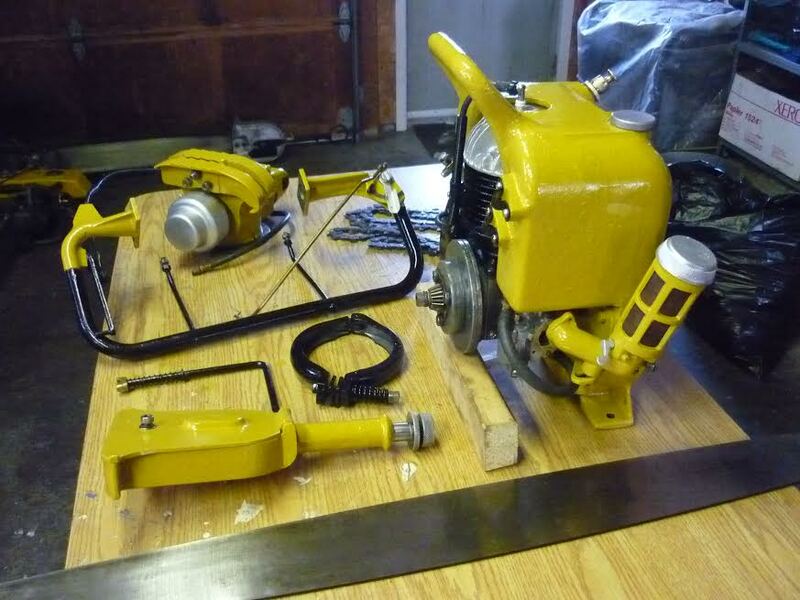 The only other pre-1950 saw with a proven Nova Scotia connection is a Hornet Industries Model HJ (the same model as the Decker saw) serial number 4963, now in the collection of Alain Lamothe. 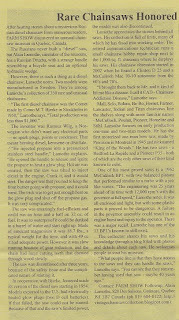 This saw was probably purchased by the Heffler Lumber Company of Sackville, Nova Scotia but no other information about this saw is known, other than an un-dated newspaper clipping with the caption “A lumberman at work…Royce Heffler using a Hornet chainsaw, the first commercially available chainsaw in Nova Scotia”. 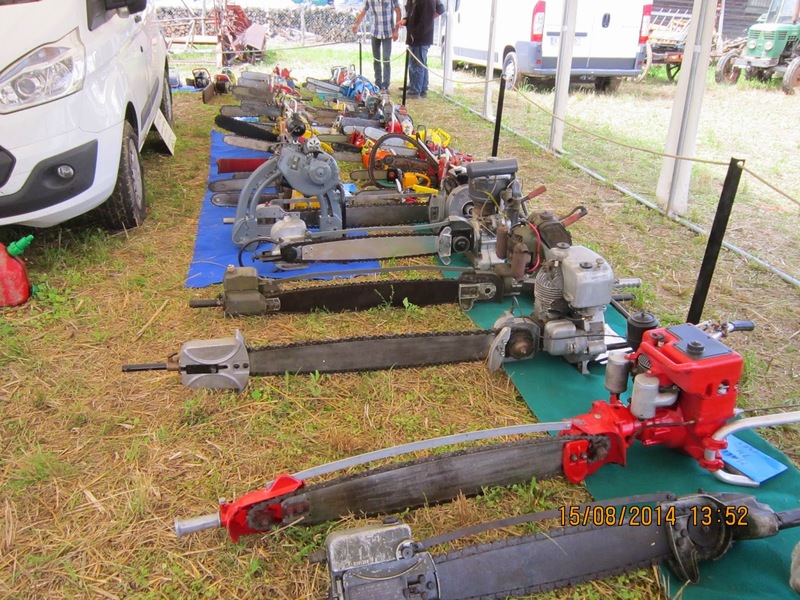 Although the serial number for the Heffler saw is lower than the Decker saw this does not necessarily mean that the Heffler saw is older as the company did not appear to follow a strict serial numbering by model. 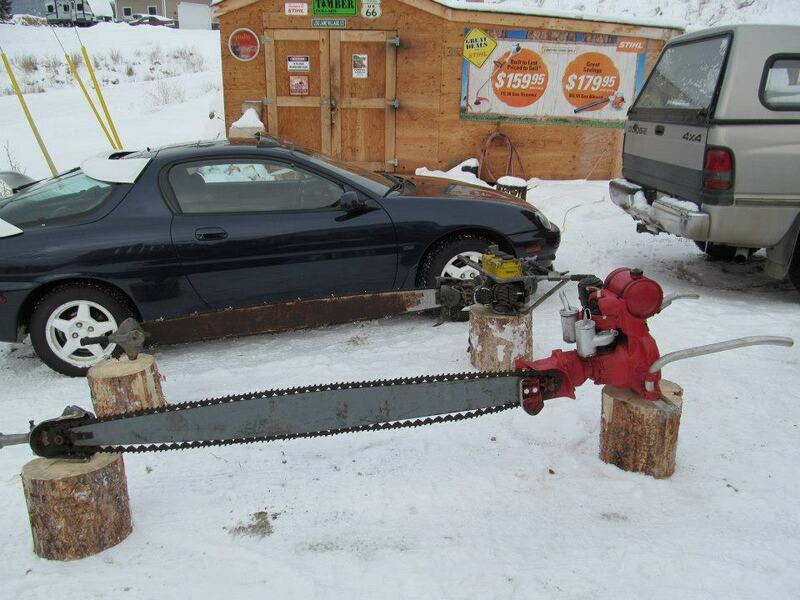 This without more information about the purchase of this saw we cannot be certain that it was purchased in Nova Scotia or purchased before the Decker saw . 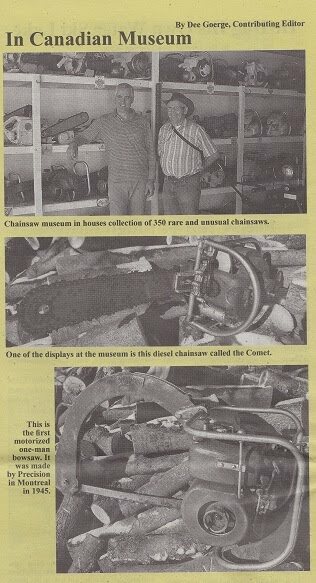 The author of this article is grateful to the Nova Scotia Forest Products Association for circulating this information to its membership to see if they have any additional information that could help document where, when and how chainsaws were first introduced to Nova Scotia. Anyone with any information is asked to contact Gordon Hammond by email at midpoint@ca.inter.net or by mail to 33 Beach Road, Clam Harbour, Nova Scotia, B0J 1Y0. If anyone has a saw that they think is 1950 or earlier please take photographs and look for manufacturer’s serial numbers and send them to me with whatever other information might be available. I will then attempt to date the saw. 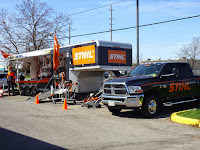 Michel Poirier, Me , Greg J. Quigg, president of Stihl Canada. HORNET HJ acquired for showroom....(before...saw on the right). After cleaning and painting...saw ready for shipping. Alain Lamothe possède une collection de 650 scies mécaniques et tronçonneuses. CHRONIQUE / Le Gatinois Alain Lamothe, 62 ans, a un musée dans la cour-arrière de sa résidence du secteur Aylmer. En fait, ce n'est pas un musée tel qu'on les connaît. Mais c'est tout comme. Et chaque été, des gens s'arrêtent chez lui pour admirer sa collection plutôt unique et inusitée. M. Lamothe a dans son hangar l'une des plus imposantes collections de scies à chaîne et de scies mécaniques antiques au monde. Je n'exagère pas: au monde. Sa collection personnelle se chiffre à 650 (!) scies mécaniques et tronçonneuses fabriquées entre 1915 et 1970. Mais les voisins d'Alain Lamothe n'ont rien à craindre. Ce dernier n'est pas amateur du film Massacre à la tronçonneuse. Technicien chez Bell Canada à la retraite, M. Lamothe est plutôt un passionné. Un vrai de vrai. Et il connaît son affaire. Il peut vous nommer chacune de ses 650 scies, leur fonctionnement, où elles ont été fabriquées et en quelle année. 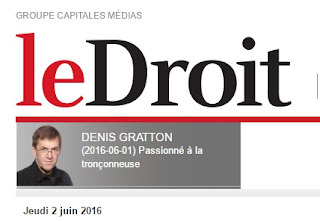 Il connaît l'historique de pratiquement toutes les compagnies de tronçonneuses de l'époque. Il peut vous dire si une scie à chaîne était populaire ou non à l'époque, et pourquoi. Et je n'ai pas osé lui demander, mais je parierais qu'il connaît le numéro de série de chacune des pièces de sa collection. 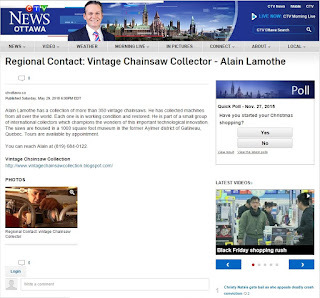 Alain Lamothe se fait un plaisir de partager sa passion avec les visiteurs. «Mais ce sont surtout des gens d'un certain âge qui s'arrêtent pour voir ça. Les jeunes n'ont pas grand intérêt là-dedans. Je les comprends. Mais en même temps, c'est un peu dommage. Parce que c'est quelque chose d'une autre époque et c'est un peu l'histoire du pays. 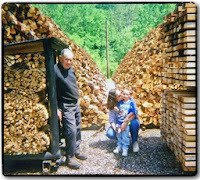 Et c'est aussi l'histoire de l'Outaouais parce que notre région est intimement liée à l'industrie du bois. - Mais qu'adviendra-t-il de votre collection, M. Lamothe, quand vous ne serez plus de ce monde? - Je vais faire ce que d'autres collectionneurs de scies à chaîne de partout au monde ont fait avant moi. Je vais dresser une liste de grands collectionneurs d'un peu partout sur la planète avec qui je fais affaires et je vais donner priorités à ces gens-là. Cette liste sera dans mon testament. - Et votre épouse en pense quoi de votre collection? - Elle aime ça. Et elle, sa passion, c'est le scrapbooking. 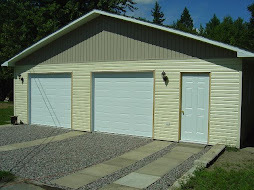 Donc j'ai pris le hangar pour mon musée. Elle a pris le sous-sol de la maison pour son passe-temps. Ce musée m'a donc coûté mon sous-sol», lance-t-il en riant. 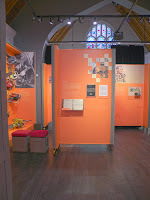 Pour en savoir d'avantage ou pour une visite du «musée» d'Alain Lamothe, consultez le sciesmecaniquesantiques.webs.com. 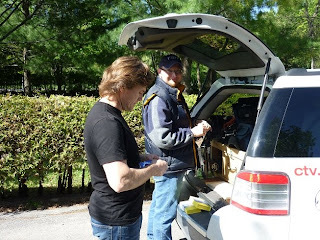 TFO television show 24.7 to be aired on the new season 2016 this fall. (time and dates to come at a later date this summer). 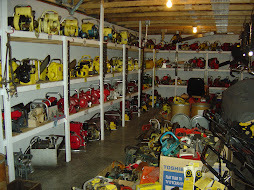 Opening the museum with more than 650 saws to look at. 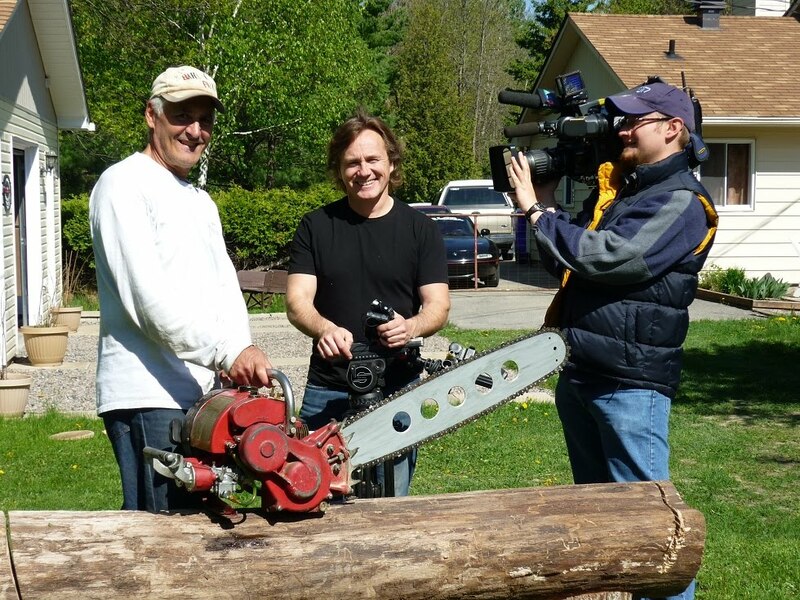 Showing some chainsaw signs, a rotary Dolmar KMS4 chainsaw (orange)and the world's largest gear driven saw, a PM (Power Machinery 385) with Jean-Philippe and cameraman Stephane. LE DROIT 27 DECEMBRE 2018 .............TECHNICAL INFORMATION PRECISION ON THE PM UNIVERSAL A.